Listen – Episode 1 of Persona 4 is from AIC A.S.T.A. with the opening “Pursuing My True Self” by Shihoko Hirata. 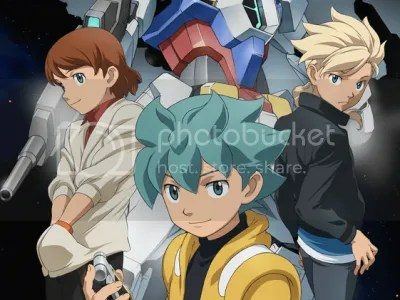 Listen – Episode 1 of Gundam AGE is from Sunrise with the opening “To Tomorrow” by Galileo Galilei. Listen – Episode 1 of Boku wa Tomodachi ga Sukunai is from AIC Build with the opening “Friends Making Group ★★☆” by Marina Inoue, Kanae Itou, Nozomi Yamamoto, Misato Fukuen, Kana Hanazawa, and Yuka Iguchi. Listen – Episode 1 of Future Diary is from asread with the ending “Blood Teller” by Faylan. Listen – Episode 1 of Ben-to is from David Production with the opening “LIVE for LIFE ~Ookamitachi no Yoru~” by Manami.